Here at Interior Folk, Sussex we put our heart and souls – and years of professional experience – into creating a perfect window treatments for our clients. Curtains and blinds really finish off a room, softening and dressing the windows complementing and anchoring the colour scheme and even taking centre stage and being a feature in their own right. Often we are asked about designing bedroom window treatments so here are some insights from our years of experience. Interior Folk like to use natural fabrics for curtains and blinds, they give texture and drape well. Window treatments are a big investment, and necessarily need to withstand changes in fashion and keep looking beautiful for 10 years or more. This is where natural fabrics come into their own. 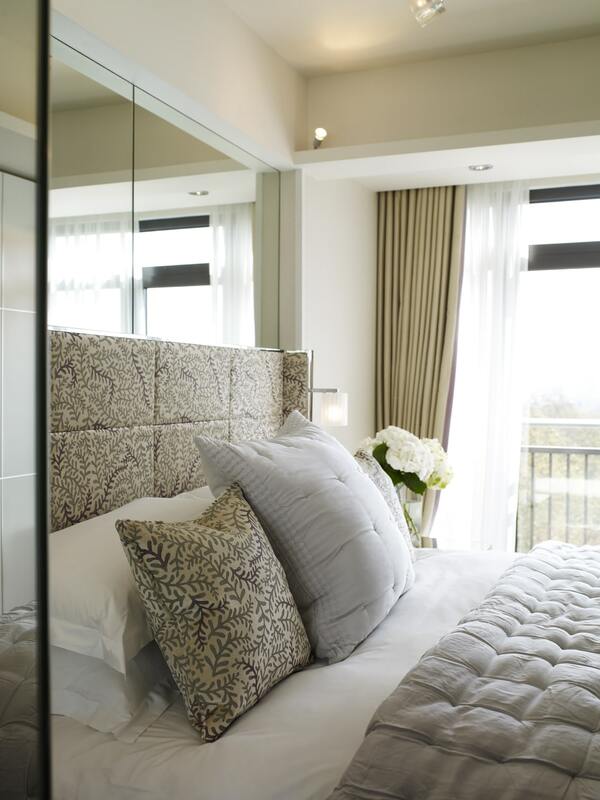 In the bedroom below we have used a silk mix to give add to the luxurious mood and create a perfect hang. When the curtains are drawn you can see the contemporary wave curtain heading is set in a recess and illuminated too creating a pleasing repeat. The recess helps ensure black out but of course if you don’t have that then you can add a pelmet to help prevent light bleed waking you. We like to use soft sheer curtains behind the main curtains. Wool is a beautiful option hanging well but plain good quality sheers in a bright white work wonders too. Sheers play an important part in relaxing the architecture and creating a warm inviting space and of course giving privacy such as here in this townhouse bedroom. Linen is loved by us for its versatility. From the heaviest weights for upholstery to the lightest of sheers, linen comes in a huge range of textures, all valued for their natural, touch-me quality. Linens are fantastic for roman blinds, lending a fluid feel to the folds, and providing a great base for colour. We used a heavy weight oyster coloured linen for the blinds in this window seat and decorated it with colourful velvet cushions. Softer linens can be used with triple-pleat or double-pleat curtain headings for a relaxed look. Linen also trumps cotton in the eco-conscious stakes, needing less water for processing. This sumptuous four-poster bed uses linen curtains, pelmets and a canopy behind the headboard. Wool is another of nature’s original eco-friendly elements. Naturally fire-retardant, biodegradable, durable and stain resistant, wool is enduring and sustainable. Luckily, it looks and feels amazing too. Wool is pliable and forgiving, not creasing like linen. We love wool for smart roman blinds for an injection of colour, or calm, restful drapes in a luxurious bedroom scheme. A chance to be more playful and add colour and pattern to the design such as this kid’s bedroom we designed with a large colourful band to the bottom of the curtains. There are so many variables in curtains and blinds, that getting the right look for your home can feel a bit daunting. Our small, friendly team can take you through the whole process, from selecting treatments and fabrics, to measuring and make-up, all the way to installing the finished product. Do get in touch and see how we can help.